This morning I opened my eyes and thought "ahhh. . . Saturday". One of the most pleasant sounding words in the English language. Or any language. There are others, of course - vacation, chocolate, sale (as in the shoes I've been eyeing). But today, it's Saturday and I am relishing the fact that I can spend this morning puttering around the house. And getting this very tardy entry posted. At noon, I'm off to Manchester, an hour's drive west, to have lunch with a friend I haven't seen in many months. Then back to the seacoast and dinner at Pam and Michael's home. Last weekend I mentioned to Pam that I was making a fruit tart for my next post. "Do you need assistance with [eating] that?" she asked. 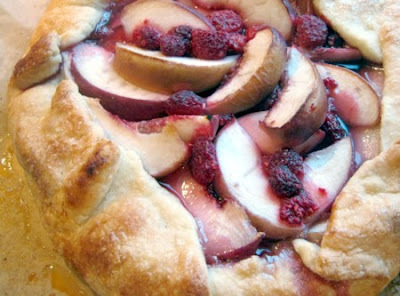 We had an enjoyable Saturday evening, tucking into a peach-raspberry tart. So enjoyable, in fact, that I forgot to take proper photographs but did manage to snap the last few scrappy slices. Make this tart! 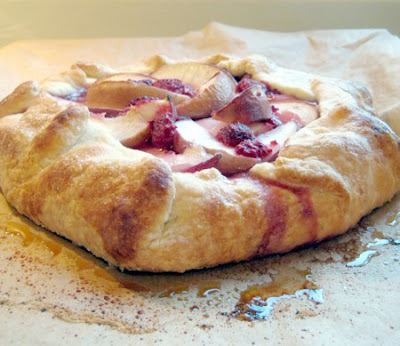 It is easy, the crust is utterly flaky yet sturdy enough to contain the fruit without leaking (using a French pastry technique called "fraisage"), and you can let your taste buds dictate the combination of stone fruit and berries - plums/raspberries, peaches/blueberries, apricots/blackberries, to name a few. FOR THE DOUGH: In food processor, pluse flour and salt to combine, about three 1-second pulses. Scatter butter pieces over flour, then pulse until texture resembles coarse bread crumbs and butter pieces about the size of small peas remain, ten to twelve 1-second pulses. Sprinkle 1 tablespoon water over mixture and process1 second; repeat until dough begins to form small curds and holds together when pinches with fingers. Empty dough onto work surface; dough will be crumbly (if dough has large dry areas, sprinkle additional 2 teaspoons water over dry areas and incorporate by gently fluffing entire amount of dough with fingers). Using bench scraper, gather dough into a rough mound about 12 inches long and 4 inches wide (mound should be perpendicular to edge of counter). Beginning from farthest end, use heel of a hand to smear about one sixth of dough against work surface away from you. Repeat until all dough has been worked. Using bench scraper, gather dough again and repeat. Dough should now be cohesive. For dough into 4-inch disk, wrap in plastic, and refrigerate until cold and firm but malleable, about 1 hour. 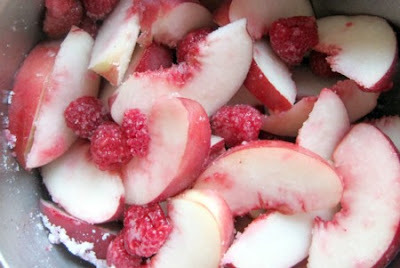 FOR THE FILLING: During the last 30 minutes of chilling, prepare fruit. Halve and pit stone fruit and cut into 1/2-thick wedges. Gently wash and dry berries. Combine fruit in medium bowl (you should have about 3 cups); set aside. Adjust oven rack to lower-middle position and heat over to 400 degrees. TO ASSEMBLE AND BAKE: (If dough has chilled longer than 1 hour and is cold and hard, let stand at room temperature15 to 20 minutes before proceeding). On large sheet of parchment paper lightly dusted with flour, roll dough to 12-inch round about 3/16 inch thick (about the height of three quarters), dusting with flour as needed. (If dough sticks to parchment, gently loosen and lift sticky areas with bench scraper and dust parchment with additional flour). Slide parchment and dough onto baking sheet and refrigerate until cool and firm yet pliant, 15 to 30 minutes (if refrigerated longer and dough is hard and brittle, let stand at room temperature until pliant). Sprinkle fruit with sugar and toss gently to combine. Remove baking sheet with dough from refrigerator. Mound fruit in center of dough, leaving 2-1/2 inch border around edge. Carefully grasp one edge of dough and fold up outer 2 inches over fruit, leaving 1/2-inch space inside the fold free of fruit. 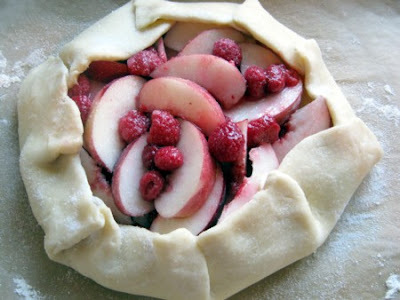 Repeat around circumference of tart, overlapping dough every 2 to 3 inches; gently pinch pleated dough to secure but do not press dough into fruit. Working quickly, brush dough with water and sprinkle evenly with 1 tablespoon sugar. 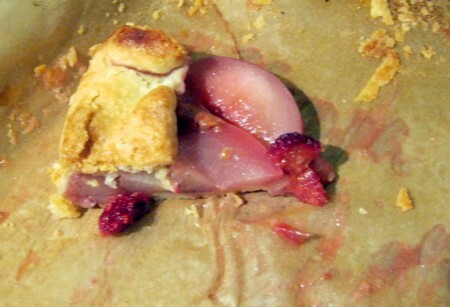 Bake tart until crust is deep golden brown and fruit is bubbling, 50 to 55 minutes. Cool tart on baking sheet on wire rack 10 minutes. Using offset or wide metal spatula, loosen tart from parchment and carefully slide tart off parchment onto wire rack; cool until warm, about 30 minutes, or to room temperature, about 1 hour. Cut into wedges and serve.